Found 2 file extension associations related to ScriptMaker and 1 file format developed specifically for use with ScriptMaker. 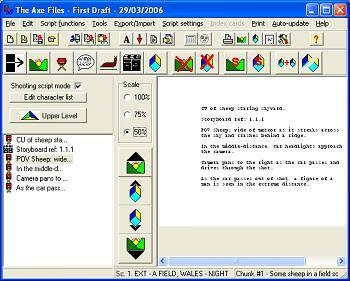 ScriptMaker is software for automatically formating screenplays and produces professional quality printed output comparible with equivalent commercial tools costing hundreds of dollars. ScriptMaker stores a list of character names and even guesses which character-name you want to use next. With ScriptMaker, you can transform your screenplay or small sections of it into XML, for collaborating with other ScriptMaker users or for transforming your screenplay into a web-page. ScriptMaker stores much more than just your screenplay. You can store synopsis and treatment data, and link it with the relevant portion of your screenplay. This data can then be used to generate RTF files containing a one-page synopsis, detailed treatment as well as the screenplay itself. You can also save and load individual scenes. If you need more information please contact the developers of ScriptMaker (Free Film software), or check out their product website.